Thanks to the hosts at Mom's Small Victories, I'm Lost in Books, and Savvy Working Girl, we've all come out winners in this readathon! I know all our TBRs are now miles-miles-miles long now! 1. No. 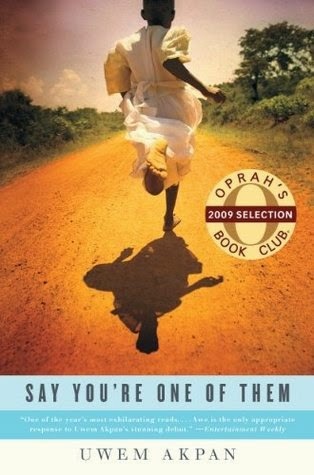 of books to read and review: 1-2. I was only able to join one. 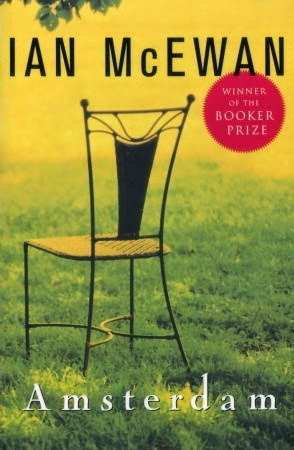 Here's the long answer to GirlXOXO's Mini Challenge which had me going through my archives for some of my notable reads that I recommend for reading around the world. And here's my foodie reads list. First, thank you to everyone who joined in the challenge! I hope you enjoyed putting together your book map or it's inspired you to think about making your own in the future. I had fun putting together the tutorials (here and here) and even tweaked a few details with your help! Two weeks yielded a variety of book maps. I love the creativity! Heather at Based on a True Story logged all her 2014 reads, and she has been around the world and back already by the looks of it! Gail at Living the Barefoot Life focused on children's books. Check out the Granny Went to Market ... she traipsed the entire world to finish her shopping! Jessica from Book Reviews from a Christian Gal decided to map the birthplaces of some of her favourite authors. What a wonderfully creative way of mapping one's reads! I love learning about authors! Litha Nelle of Victorian Soul (Book) Critiques not only mapped her past reads by year, categorized them by genre, and she even mapped her TBR. To top it all, her map colours match her blog perfectly. Lots of details, and she's got a lot of good reading to look forward to! Tanya at Mom's Small Victories did a rainbow-hued map (looky here) highlighting countries. All you have to do is click on a country and find out the books set there! 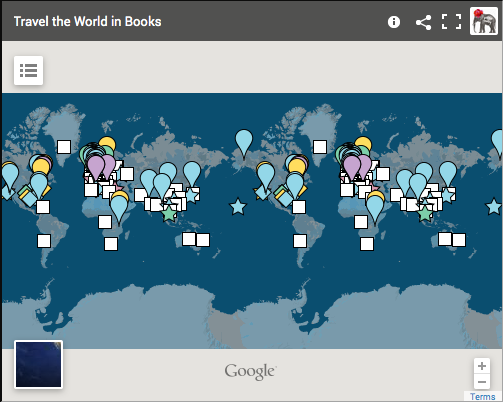 Deb at Readerbuzz created a map of books she scoped out for her primary school students. The fun part is that her classes must be a blast -- aside from reading and mapping the book/s,there's music and partying too (all appropriate for the book setting, of course). Congrats to Litha Nelle of Victorian Soul (Book) Critiques! 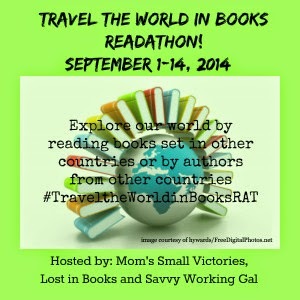 The readathon is over but the Travel the World in Book Challenge is going to be around if you still want to get in on the action! Happy travels! Thanks Aloi! I'm glad you liked my map- I had a lot of fun making it. Thank you for this great challenge. I learned something new!